Product code: ES7830cc Categories: Antique, Antique Engagement Rings, Antique Rings. Every once in a while, a magnificent antique ring comes along that takes your breath away, and so easily it will be this one. This incredible Victorian era antique ruby and diamond ring is not only set with superb quality natural rubies, large diamonds but also has the most exquisite scroll work on the sides. Beautifully hand made in the late Victorian era of the 1890’s, this ring is set with two magnificent quality natural rubies that display not only a fine quality red colour, but also show superb transparency that allows the light to enter each ruby and dance around making them show their magnificent quality for all to see. The quality of these rubies is superb and they total 1.52 carats and are highlighted so well by the 18 carat yellow gold and the diamonds which flank them. The centre European cut diamond measures an impressive 2.15 carats and the other European cut diamond set on each side come together to total 1.82 carats. The sparkle given off by these lovely diamonds is immense and they are all G in colour and VS in clarity. And then to highlight the ring even further are the addition of eight smaller rose cut diamonds that total 0.04 carats bringing the total diamond weight in this ring to an impressive 4.01 carats. Measuring 22mm from left to right by 7.6mm wide at the centre, looking at the ring from the side exemplifies the extremely high quality of craftsmanship that went into hand making this ring over 120 years ago. This scroll work exemplifies the high quality of craftsmanship that went into making this ring which is only matched by the superb quality of both the rubies and the diamonds. There is little doubt that this ring is one that will always be admired and appreciated for both the quality of the gemstones as well as the work and incredible detail that went into making this ring, and is a perfect example of high quality antique jewellery at its finest. 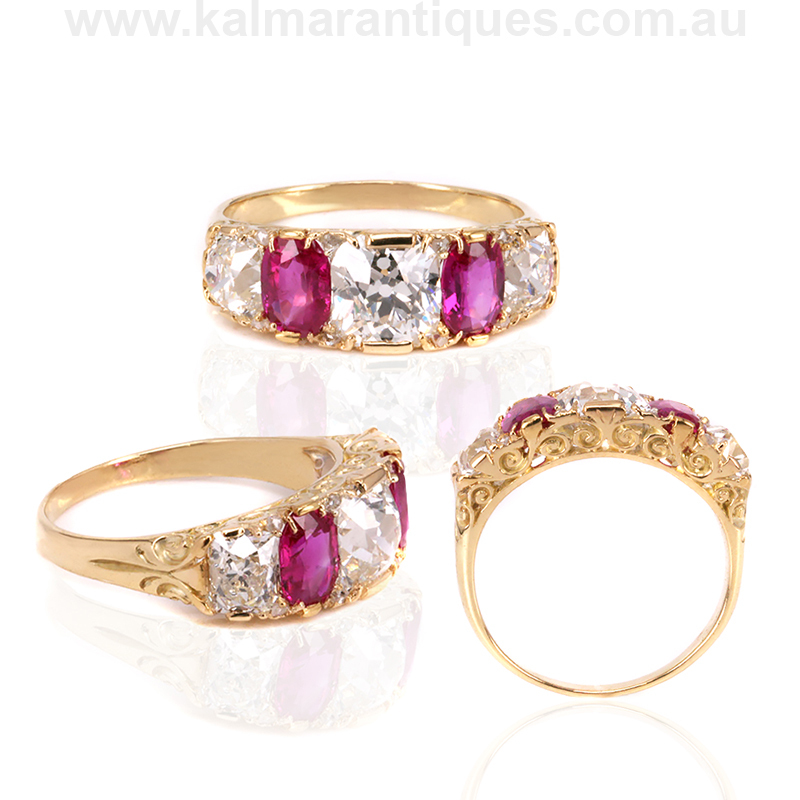 Tags: Antique ruby and diamond engagement ring, Antique ruby diamond ring. Set with over 4 carats of antique European cut diamonds and antique rose cut diamonds. This antique ruby and diamond ring would suit any finger or occasion, including making an spectacular example of a ruby and diamond anniversary ring or an amazing antique ruby and diamond engagement ring.